For a truly traditional seaside experience hire a beach hut! Bournemouth has over 250 beach huts for hire at Alum Chine, Durley Chine, Bournemouth, Boscombe, Southbourne and Fishermans Walk. First invented in Bournemouth, some of Bournemouth’s beach huts are the oldest in the UK and each comes equipped with a cupboard, a side table, four deck chairs, a gas ring and curtains. Please note that no crockery or cooking utensils are provided. Access ramps are also available from beach offices for wheelchair users. Or why not go a little more modern and hire a funky beach pod at Boscombe Beach? These pods have been designed by Wayne Hemingway MBE and Geraldine Hemingway MBE and have each been individually designed. The pods, which are exclusive to Bournemouth, feature mains electric and a private balcony with beautiful views of the Isle of Wight and the Purbeck coast. Slightly more upmarket than the average beach hut, each pod has a toaster, kettle, microwave, sandwich maker, curtains and beach furniture. These pods are only available for weekly hire but are a wonderful place to entertain friends while enjoying the sand and surf of Boscombe. Or why not go the whole hog and rent one of the new contemporary Bournemouth Beach Lodges, available for self-catering holidays for three, four or seven nights throughout the year! They can sleep up to 5 (4 adults and 1 child) and come complete with compact bathroom with WC, basin, heated towel radiator and shower, fully equipped galley kitchenette with hob, integrated fridge and storage, slimline storage throughout the Lodge, TV with Freeview and Free Wi-Fi. Beach huts can be rented daily, weekly or for block periods. The 2019 daily rate starts at £39.00 rising up to £59.00 a day in peak season. Weekly rates vary from £125.00 to £225.00. The popular Boscombe Beach Pods can only be rented by the week with prices from £139.00 to £275.00. Full pricing details can be found on the bournemouth.co.uk website and bookings can be made online. You may also find some beach hut tenants that rent out their beach huts directly. Poole has approximately 65 beach huts for hire at Sandbanks, Shore Road, Canford Cliffs, Branksome Chine and Branksome Dene Chine. All these beach huts come complete with 2 deck chairs, 4 plastic chairs, plastic table, parasol/sun shade, storage cupboard, worktop and curtains. Cooking facilities are not provided. Some beach huts even have a water or water and electricity supply and some have disabled access. You are allowed to have a BBQ near to your beach hut however please be considerate to other users. Also when you leave all litter must be taken with you and the beach hut left clean a tidy. 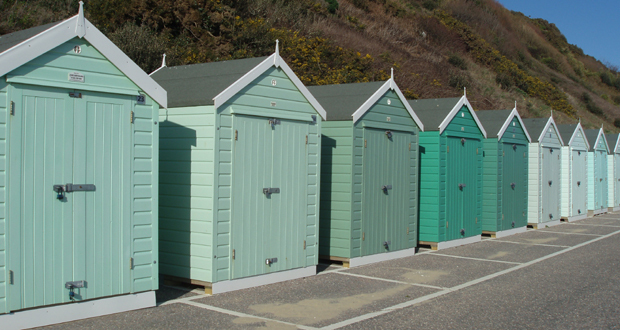 Beach huts are available to rent by the day, by the week and for winter hire. Single day hire is not available during the Winter period. Please note that daily bookings are only available if the beach hut has not been booked for a week. Currently the daily rate is £39.00, and the weekly rate varies between £125.00 and £315.00 a week depending on the time of year and amenities at the beach hut. Winter lets of 6 months and 1 week’s hire are available from around the end of September to the middle of March. Full payment is required at the time of booking. Also when you collect the keys on arrival a refundable £10 cash deposit is required. If you are an Access to Leisure and Learning card holder you qualify for a 50% discount on all beach hut hire on certain dates throughout the year. For more details please call their customer services department on 01202 708181. You are not permitted to stay overnight in the beach huts of Poole, they are to be used for daytime use only. Bookings can be made up to a year in advance and they can get booked up fast so book early to avoid disappointment. So hire a beach hut today, it’s a perfect way to spend a day at the beach!